1. Clinton Wells, 2. Otis Brewer, 3. Alton Smith, 4, Harvey Lowe, 5. Unknown, 6. ____ Fowler, 7. ____ Nesbit, 8. Durand Thrailkill, 9. Clifford, 10. Albert Mason, 11. Marine King, 12. Unknown, 13. Dorothy Reddick, 14. Florence Fonville, 15. Ruth Aikin, 16. Mildred Fowler, 17. Ethel Lee, 18. Frances Fonville, 19. Emma Neal Neri, 20. Unknown, 21. Unknown, 22. Nell Henry, 23. Isabel Dodson, 24. Unknown, 25. Mary Lou, 26. Elizabeth Pace, 26. Josephine Grace Humphries, 27. Allie Smith, 28. Elizabeth Pace, 29. Mildred Alexander, 30 Unknown, 31. Ellen Smith, 32. Kathryn Lee, 33. _____ Davis, 34. Ruth Lewis, 35. Alice Bryant, 36. Ferndale Hogan, 37. Unknown, Teacher, Mrs. Joe Wells. 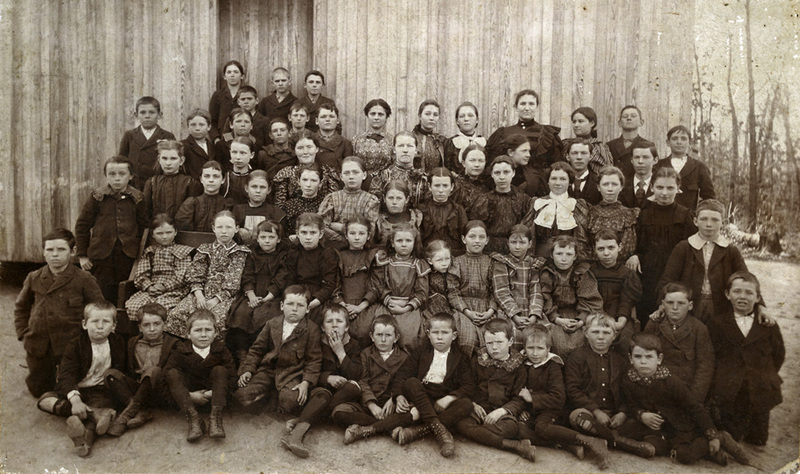 The little guy between the 4th and 5th rows who is wearing a suit, is John D. Humphries, Jr.
Below: Howard Academy, circa 1890. Enhanced from a seriously damaged, post-card sized original. Below: Howard Academy, circa 1892, Prof. Davis, teacher. 1st row: 1. Charley Wells; 2. Unknown; 3. Hamp Harrison; 4. Lee Ballard; 5. Unknown; 6. Unknown; 7. Unknown. 2nd row: 1. Horace Ballard; 2. Sidney Wootan; 3. Ed Jones; 4. Laura Jones; 5. Nonie Jones; 6. Annie Ballard; 7. Unknown; 8. Joe Wells; 9. Irene Wallace; 10. Unknown; 11. Unknown; 12. Unknown; 13. Unknown; 14. Frank Wells; 15. Maggie Dodson. 3rd row: 1. Tom Dodson; 2. Arthur Wallace; 3. Kate Dodson; 4. Unknown; 5. Minnie Dodson; 6. Willie wallace; 7. Lena Jones; 8 Prof. Davis; 9. Eland Dodson; 10. Cora Wells; 11. Mag Watts; 12. Zora Wootan; 13. Emma Dodson; 14. Emma Jones. 4th Row: 1. Unknown; 2. Ham Harrison; 3. ___Wells; 4. Unknown; 5. Unknown; 6. Berry Wootan; 7. Morgan Dodson; 8. ___Wells. 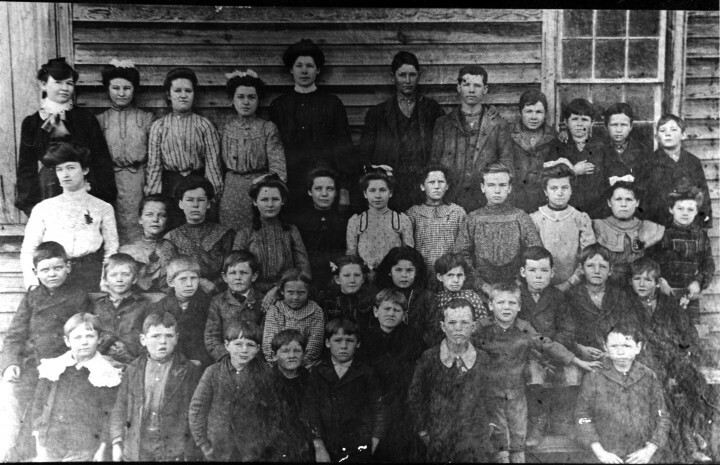 See some history of The Oak School, below. 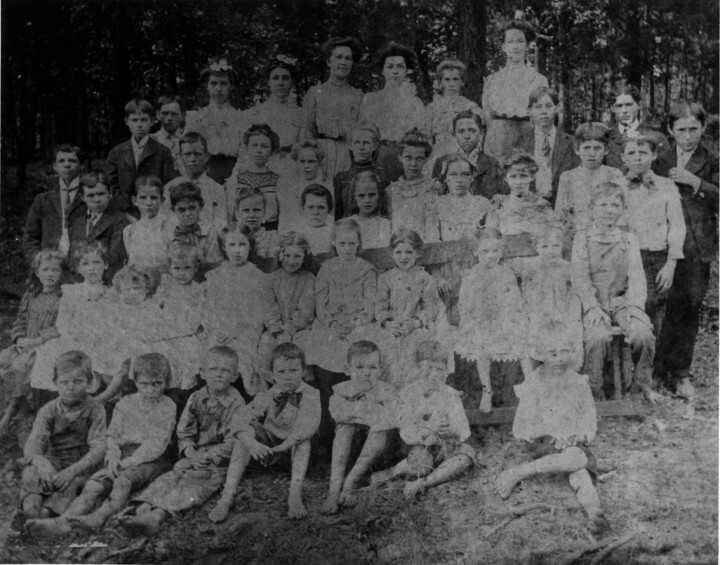 2nd row: Henry Todd, Ruby Lee, Mrs. W. J. Lee and Tom, Miss Lizzie Todd, Mable Kidd, Powell Lee, Olin Todd, Wilson Bell. 1st row: 1. Sam Jones, 2. Frank Terrell, 3. David (Buddy) Pope, 4. Jim B. Beasley, 5. Eugene Reeves, 6. Unknown, 7. George Moody, 8. B. D. Stephens, 9. Duard Terrell. 2nd row: 1. Vera Stephens, 2. Ruben Baker, 3. Clifford Kidd, 4. Dan Ed Humphries, 5. Tela Holland, 6. Sallie Ree Humphries, 7. Essie Reeves, 8. Maud Kidd, 9. Carl Terrell, 10. Glenn McNair, 11. Allen McNair. 3rd row: 1. Miss Minnie Coogler (teacher); 2. Florence Stephens; 3. Della Reeves; 4. Ethel McNair; 5. Blanch Stephens; 6. Mollie Kidd; 7. Buela Holland. 4th row: 1. Clyde McNair; 2. Mary Jones; 3. Mattie McNair; 4. Annie Terrell; 5. Eunice Reeves; 6. William McNair; 7. Raymnd Terrell; 8. Lorrell Terrell; 9. Irby Terrell; 10. Amos Baker; 11. Howard Pope. 1st row: 1. Vera Stephens; 2. Unknown; 3. Dan Ed Humphries; 4. Duard Terrell; 5. Carl Terrell. 2nd row: Eunice Thames; 2. Maud Kidd; Carnie Kidd; 4. Unknown; 5. Vernie Mitchell; 6. Unknown; 7. Bettie Pope; 8. Unknown; 9. Nettie Pope; 10. Unknown; 11. Howard Pope. 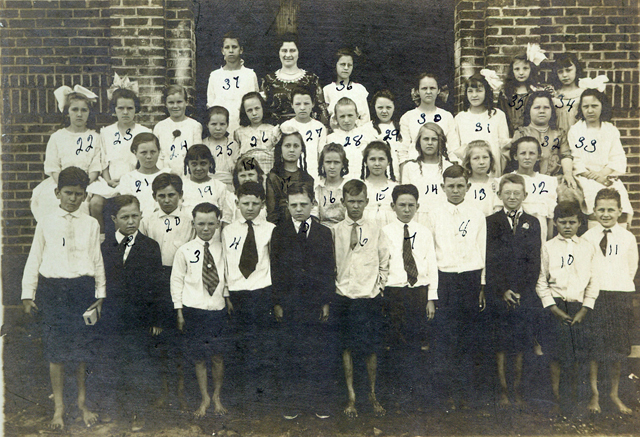 3rd row: Raymond Terrell; 2. Lorrell Terrell; 3. Will Kidd; 4. Earl Wesley; 5. Florence Stephens; 6. Ruby Terrell; 7. Unknown; 8. Blanche Stephens; Kate Brown; 10: Lila Pope; 11. Lewis Kidd; 12. Irby Terrell; 13. Henry Wesley. 4th row: 1. Luke Pope; 2. Tom Carter; 3. Lester Brown; 4. Unknown; 5. Unknown; 6. Olin Mitchel; 7. John Pope. 5th row: 1. Oscar Carter; 2. Lila Mitchell; 3. Dannie Wesley; 4. Miss Edna Huie (teacher); 5. Annie Terrell; 6. Mable Kidd; 7. Exa Huie. 1st row: 1. Girl; 2. boy; 3. Gladys Jones; 4. Frank Peebles; 5. Asberry Bryant; 6. Merle Perdue; 7. Wayne Smith; 8. Marie Meertier; 9. Lawrence Campbell; 10. Ethel Lassiter. 2nd row: Claud Hines; 2. Elmer Dailey; 3. Unknown; 4. Eleanor Pace; 5. Unknown; 6. Ethel Harrison; 7. Unknown; 8. Helen Holland; 9. Unknown; 10. William Akin. 3rd. row: 1. Unknown; 2. Unknown; 3. Dan Wells; 4. Esther Volan; 5. Katheryn Dunn; 6. Aeive Gilbert; 7. Neill Leach; 8. Unknown. 4th row: Jere Wells, teacher; 2. Unknown; 3. E. G. Webb; 4. Unknown; 5. Unknown. 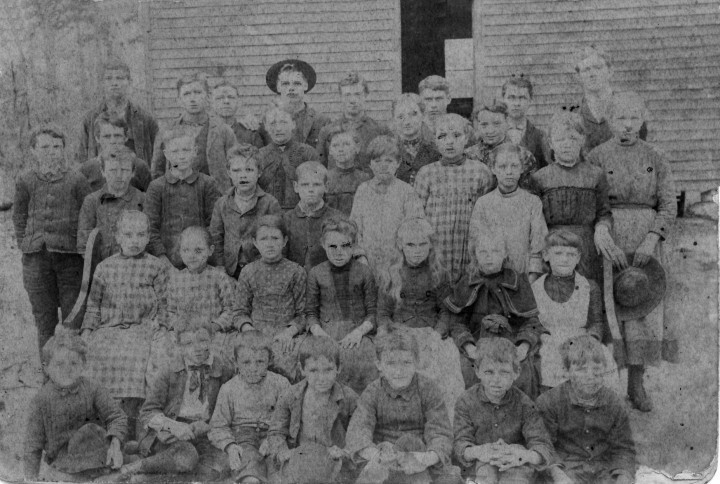 The Oak School was a one-room, one-teacher school. The building was constructed on Terrell's Mill Road by Clayton County in 1895 and first served as court held by Justice of the Peace, Mr. F. M. Terrell. 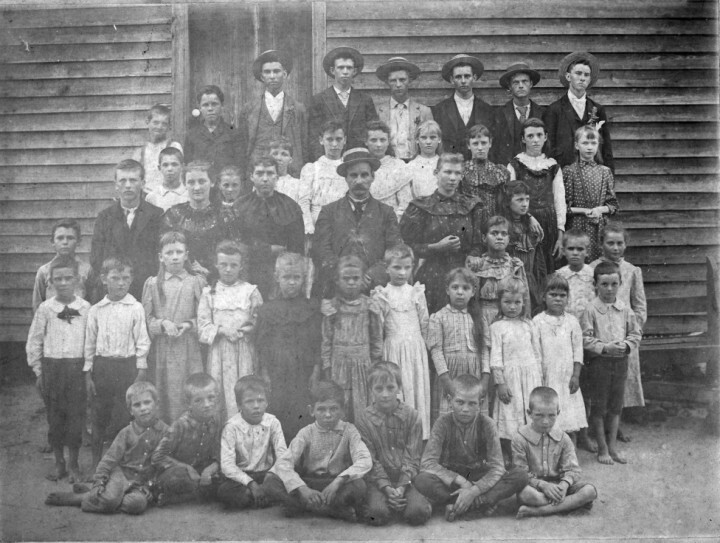 It opened as the Oak School in the fall of 1896 with Miss Lizzie Todd as the teacher of about 25 students. 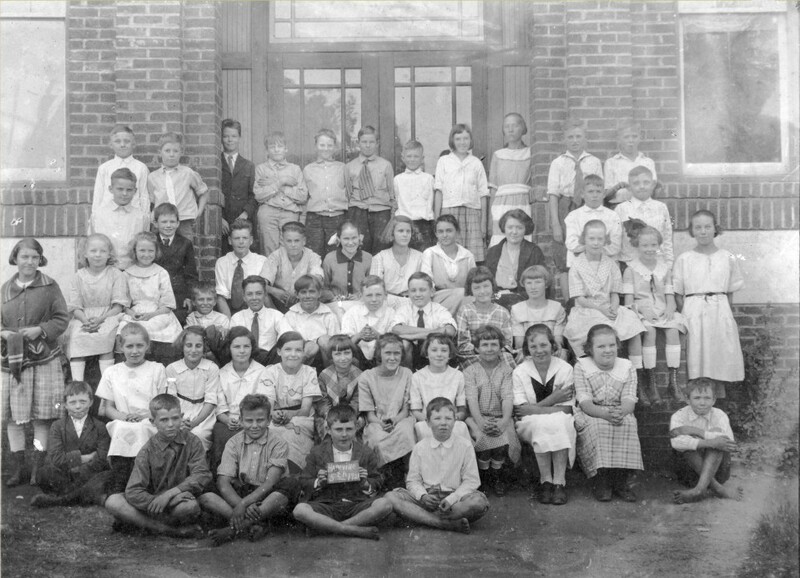 The children had been going to Howard Academy near Mountain View (Rough and Ready) but that building burned, so the courthouse was used for a school until about 1912. 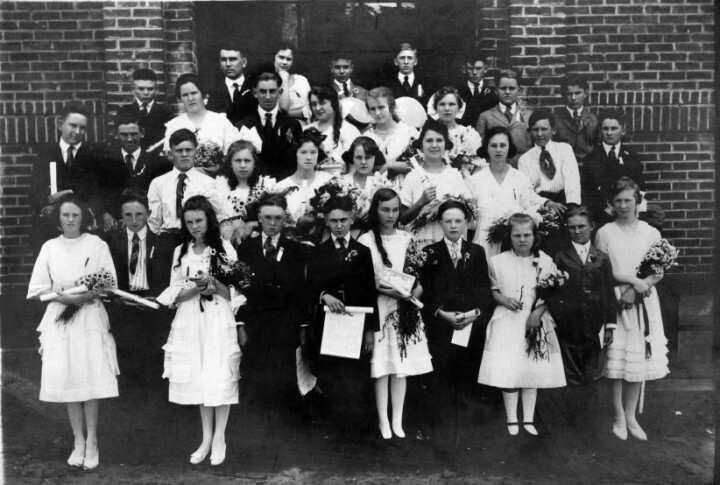 During that time, other teachers were Miss Minnie Coogler, Miss Lizzie B. Lasseter, Miss Ida Mae Huie, Mr Robert Todd, Miss Mary Archer, and Mr. Frank Wells. Parents contributed to the teacher's salary. Lunch was one hour, and some children went home for lunch. 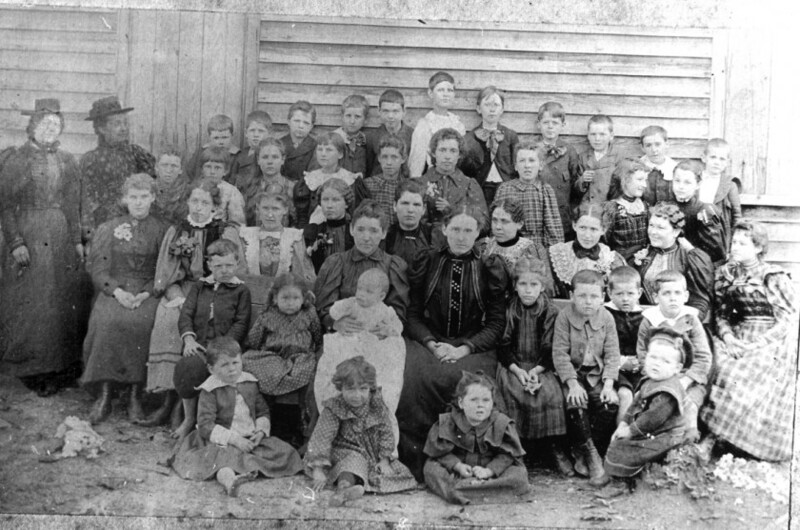 The school term was about 6 months and as all children were in one room, older children helped younger ones. After receiving a certificate from the Oak School, children could go to nearby Hapeville High School (paying tuition, as it was in Fulton County) or to Jonesboro High School, which was free for county children, but was 10 miles away. The Oak school/court house building continued to be used by the community for various purposes for more than 50 years. This information is from History of Clayton County Georgia 1821 - 1883.